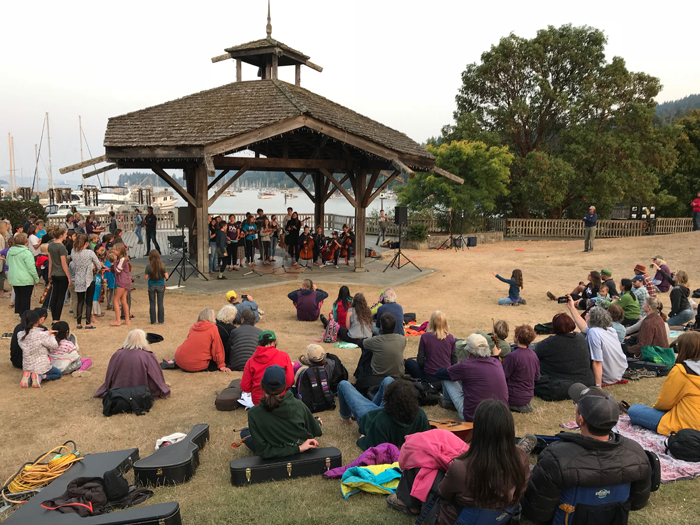 Fiddleworks camp instructors and students play a free concert to an appreciative crowd at Centennial Park on Friday as part of the wrap-up to their 2018 season. A Salt Spring resident is seeking to bring back a quintessential part of her island experience by encouraging musicians to perform in Centennial Park. Yvonne Saunders was a frequent visitor to Salt Spring before she moved here, often coming over from West Vancouver to see her mother who lived on the island from 1991 to 2001. One of the things she liked most about the community was the “village green” quality of the park, where live music and dancing were often found on market Saturdays. Even a couple of years back, Saunders notes, it was not uncommon to hear the sounds of groups like the always-popular Oka winding through town from the park gazebo. The low cost to rent the space — at current rates $10.61 per hour or a maximum $53 per day — ensures a prime location and a power hook-up. “It’s a lovely building, right on the waterfront, and has everything you need,” Saunders said. The park did play host to the Fiddleworks finale concert on Friday night and will be home to this year’s post-parade Pride party. But fewer acts seem to be taking advantage of the venue this summer. Salt Spring’s parks and recreation manager for the Capital Regional District, Dan Ovington, said he’s not sure if the gazebo is seeing fewer rentals or why that might be. While the cost is already low, the Salt Spring Parks and Recreation Commission does sometimes consider partnering with community groups for events or helping with costs, on a case by case basis. Direct sponsorship and scheduling of music acts by PARC has not been considered, however, since no such proposal has been made to the commission. “We haven’t had that request come forward,” Ovington said. He explained that when PARC did schedule bands in the past it was to promote a pilot program for extra market days on long weekend Fridays, and vendor fees for the extra sessions offset the cost. Saunders recently attended the Sidney Street Market and was thrilled by all the different musicians she found performing in the vicinity. She even took the business cards of some who had them, but she observed Salt Spring also has many talented artists and really has no need to import them. Saunders said she is willing to help organize a schedule of performers at the park, or any other job needed, and is hoping to get a few interested people before the 2018 season ends. For more information contact her at 250-931-7373. For more on this story, see the Aug. 29, 2018 issue of the Gulf Islands Driftwood newspaper, or subscribe online.